Are you ready for a satisfying bowl of deliciousness? 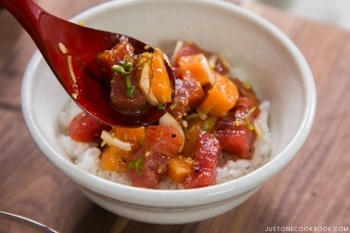 Try this delicious Tuna and Salmon Poke Bowl recipe at home. 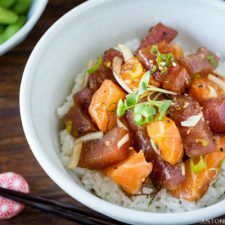 Also, plenty of ideas on how to build a fantastic poke bowl for DIY Poke Party. 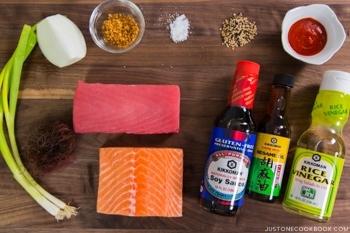 Cut sashimi-grade salmon and tuna into bite size pieces. I recommend cutting into slightly “bigger” bite size for the better texture and taste. Cut limu into smaller pieces, about ½“ (1 cm) pieces. Thinly slice the green onions. Thinly slice the onion and then cut into ¾ inch (2 cm) length. Put the salmon and tuna in a large bowl and sprinkle ¼ tsp. sea salt. Then add the onion, green onion, limu, and kukui nut. Add ⅓ cup (80 ml) gluten-free or regular soy sauce and 2 Tbsp. sesame oil. Add 1 Tbsp. rice vinegar. Sprinkle 1 Tbsp. toasted white and black sesame seeds. Serve steamed rice in a large donburi bowl or plate. Let it cool down a little bit then pile poke on top. Add toppings as you like and enjoy immediately.